How Beaverton passed a levy to secure 300 teaching positions & maintain class sizes. It’s Tuesday night at 6pm. A group of teachers and district staff trickle through the doors of Beaverton Education Association (BEA), greeting BEA President Sara Schmitt with smiles and laughs, despite having just worked an eight hour day and having a two-hour volunteer shift ahead of them. Pizza is out on the counter and volunteers settle in to begin making phone calls to a neverending of Washington County voters. One of those teachers is Oregon Education Association member Dan Coli, a physical education specialist who serves both Ridgewood Elementary and Hazeldale Elementary. Dan is one of nearly 100 educators who volunteered for the Yes for Beaverton Schools campaign this spring. The levy renewal passed by an overwhelming 71% in May’s election. Beaverton School District serves over 40,000 students in Washington County, and is the third largest district in the state. In 2012, massive statewide budget cuts caused the Beaverton School Board to pass a hotly contested budget which eliminated 344 jobs throughout the district. Average class sizes ballooned, with some high school classrooms reaching 60 students. That's right, 60. In 2013, voters passed a local option levy to restore almost all of the positions that had been eliminated. That levy provided more than $128 million, 100% of which went right back into Beaverton classrooms to fund approximately 300 teaching positions and reduce class sizes. This year, the levy was up for renewal at the same tax rate. Without it, the Beaverton School District would have seen a decrease of $30 million dollars to their 2018-19 budget, potentially leading to layoffs for the 300 teacher who had been brought back four years prior. With the memory of those 344 cut positions fresh in their minds, Beaverton educators sprung into action. 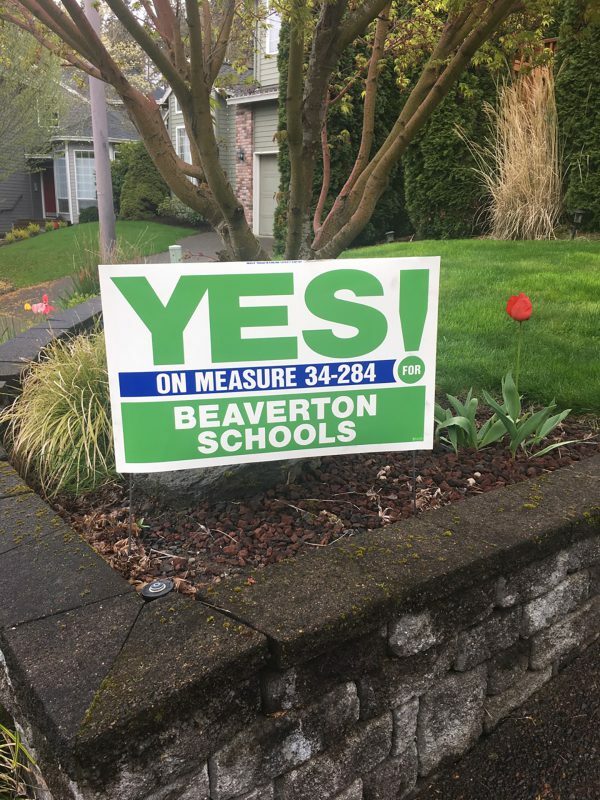 In just a few short months, over 20 canvasses happened across Beaverton School District, and nine phone banks were held at Beaverton Education Association to contact over 3,000 voters. Teachers, district staff, and parents passed out nearly 10,000 flyers and distributed 1,000 lawn signs. Dance was one of dozens of BEA building reps who contributed to organizing a canvass or recruiting volunteers for a phone bank. West Tualatin View teachers and BEA members led by educator and BEA co-representative Lindsay Dance prepare to canvass in support of their local levy renewal. As an Oregon Education Association member, you are part of 44,000-members-strong organization working to provide the basic right of a great education to every student. You are also part of a local affiliate working to create change right in your neighborhood! This gives you tremendous power to advocate for yourself, the students you serve, and your school community in local and statewide politics. Reach out to your building rep for information on getting involved. Not sure who that is? Contact OEA's Membership department at 503-684-3300, or send an email to help@oregoned.org.